My name is Kerri Criss and I am a 39-year-old college student who is a quadriplegic. I was injured November 15, 2006. I have done well with meeting my medical needs up to this point. I am now ready to rejoin the work force and the main obstacle I continue to face is transportation. I am a full-time student at Penn State Shenango majoring in Human Development & Family Services. Once I graduate and find a job, it will be even more important to have a reliable and safe way to get back and forth to work with my motorized wheelchair. Purchasing a wheelchair accessible vehicle is essential for me in order to reach my goal of graduation and to maintain my independence. A wheelchair accessible vehicle is extremely expensive, especially when I factor in the necessary modifications that will need to be made in order for me to drive it. These vans can cost anywhere from $20,000-$40,000 and this is an expense I can only afford with the help of my family, friends and community. To help offset this expense, a fundraising campaign in my honor has been established with Help Hope Live. To make a tax-deductible donation, click Donate Now. Thank you in advance for your prayers, generosity, and support. Penn State Shenango will hold its 2017 Spring Commencement Ceremony at 11:30 a.m. Saturday, May 6, in the Shenango campus auditorium with a reception immediately following. Jo Anne Carrick, campus director, will confer baccalaureate and associate degrees on the graduating students. The ceremony will open with the academic processional played by pianist Janet Stahl, followed by the National Anthem sung by the Shenango Valley Chorale, under the direction of Stephen Barr. Philip Nash, associate professor of history and faculty marshal, will welcome graduates, family members, and guests to the 2017 commencement ceremony. This year’s commencement address speaker is Kathy Mastrian, associate professor and program coordinator in nursing at Penn State Shenango. Mastrian has been involved in the education of nontraditional aged students for over 37 years in the RN to BSN Nursing program at Penn State. She pioneered the use of Credit by Portfolio Assessment to award advanced standing nursing credit for registered nurses. She has also been active in the development of technology enhanced courses for registered nurses facilitating asynchronous participation and active and collaborative learning. She is one of the founding proposers to place the RN to BS program online for the Penn State’s World Campus, has developed six of the courses for that curriculum, and teaches at least one section per semester for the World Campus program. Mastrian has published over 30 nursing journal articles and published several books. “Nursing Informatics and the Foundation of Knowledge” is now in its fourth edition (Jones and Bartlett 2009, 2012, 2015, and 2018). This textbook has been sold in the US and abroad, and was recently recognized as a book of the year by the American Journal of Nursing (AJN). She is a co-author of “Integrating Technology in Nursing Education: Tools for the Knowledge Age” (Jones and Bartlett 2010) that also won AJN Book of the year for 2010. A new text, titled “Informatics for Health Professionals” and published by Jones and Bartlett, was released March 2016. This year’s graduating student speaker is Kerri Criss. She will be graduating with an associate degree in human development and family studies (HDFS). Criss is a nontraditional student who began her education at the Shenango campus in the spring of 2015, at the age of 37. During her time at the campus, Criss was named to the Dean’s List and completed two internships. The first internship was with the Keystone Blind Association, where she worked with the visually impaired community. Her second internship was with Whole Life Services, where she assisted in its Program Development department for the intellectually disabled community. Criss is a member of the Shenango campus Blue and White Society and enjoyed traveling with the campus’ Student Affairs staff to New York City for its annual Thanksgiving weekend student trip. 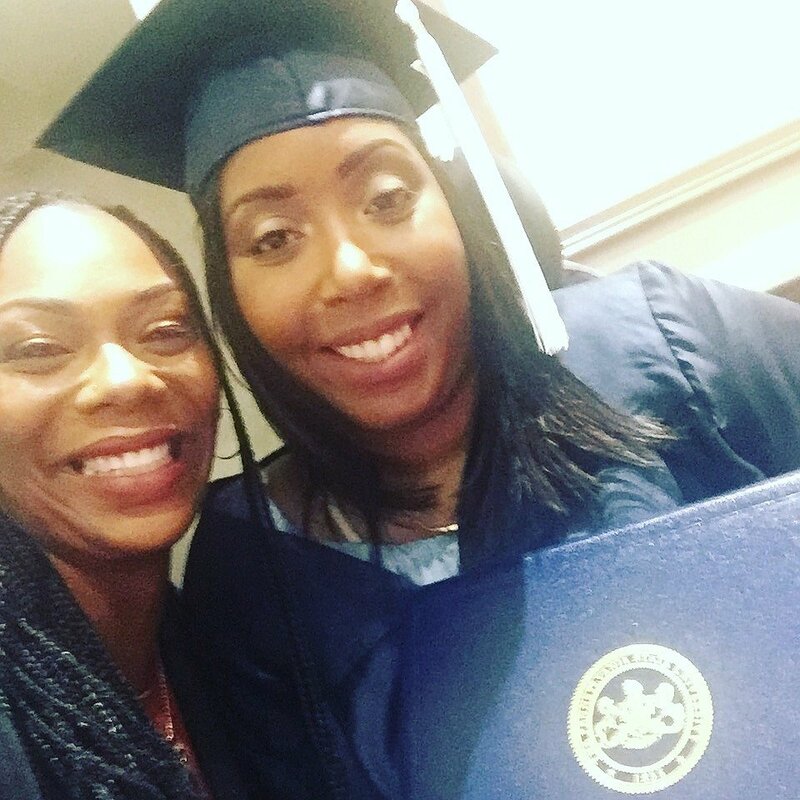 Upon graduation, Criss plans to continue advocating for the disabled community and further her education at Penn State Shenango to attain a bachelor’s degree in HDFS. Her long-term goal is to achieve a master’s degree and work with at-risk female adolescents. She is the mother of two adult children. The commencement ceremony will conclude with the induction of the 2017 Penn State graduates into the Penn State Shenango Alumni Society by Society President Nicki Biles. For more information about this year’s graduation ceremony, contact the Registrar’s Office at 724-983-2856. I am proud to say that through all of my trials and tribulations I graduated on May 5, 2017! I received an associates in science from Penn State University. This fall I will continue on in my major (Human Development and Family Studies) in order to receive a bachelors degree. My long term goal is to receive a masters in social work. I believe that furthering my education will allow me to be a blessing to those in need. I am truly grateful to everyone who has given me love and support. Finally made the Dean’s List 3.8 GPA, so super excited!!! Thanks again everybody who is donating to help me become mobile! The support of everyone is so very much appreciated!!!! Many thanks and may God bless you. Hi Kerri! I only had the pleasure of meeting you twice while I was home. Brad and I will give what we can! Love you, Kerri! See you soon!